The Square (El-Midan), one of the few Egyptian films to be nominated for an award at the Emmys and the first to have been nominated at the Oscars, has won three prestigious Emmy awards. The documentary, which paints a captivating and moving chronicle of Egypt’s protests since the January 25 revolution, had been nominated for a fourth award, ‘Outstanding Documentary or Non-fiction Special,’ but missed out to PBS’ JFK (American Experience). The first award for cinematography was shared by Jehane Noujaim, Muhammed Hamdy, Ahmed Hassan and Cressida Trew. The second award for outstanding directing was won by Jehane Noujaim while the third for picture editing was jointly won by Pedro Kos, Christopher de la Torre and Mohamed El Manasterly. 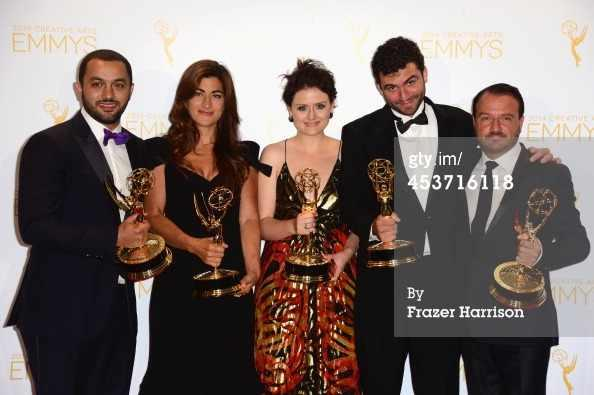 Members of The Square film team attended the Emmys at the prestigious awards. Despite immense support from Egypt and abroad earlier this year, The Square had missed out on an Oscar for Best Documentary Feature but still managed to win the hearts and minds of many across the globe. Despite being present at the Emmys and The Academy Awards, The Square was never officially released in Egypt. While government censors denied that the documentary had been censored, The Square’s team had stated they had never received permission to screen the documentary which closely follows the January 25 revolution and the events that follow.